[via cnn] In an internal presentation, Toyota staffers boasted of the company saving $100 million by negotiating a limited recall for Toyota Camry and Lexus ES cars over a problem that could cause unintended acceleration. 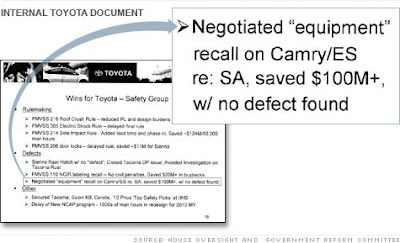 In an internal Toyota (TM) document used as part of a company presentation on its government relations, dated July 6, 2009, the phrase "Negotiated 'equipment' recall on Camry/ES re: [sudden acceleration], saved $100 million+ with no defect found" is among a bullet-pointed list of "wins." An "equipment" recall is a more limited type of recall, often to repair an accessory or non-essential part of the vehicle. The presentation was given to Yoshi Inaba, Toyota's top North American executive. The reference was apparently to a September 2007 recall to secure floor mats that could trap the cars' gas pedals. In August 2009, the month following the presentation in which the executive boasted of saving $100 million over a full recall, a family of four was killed in a Lexus with its gas pedal stuck under a floor mat. In November 2009, Toyota had full recall to reconfigure the gas pedals of numerous Toyota models to prevent such incidents.